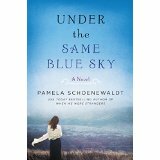 I’m happy to share our first blurbs from advance copies of my coming-in-May third novel, Under the Same Blue Sky. ‹ “We struck oil!” he gushed. Wish I could come to the book launch in Knoxville. That would be so much fun! Will you do any readings or publicity in Philadelphia? Hi Lucy. There is nothing planned now but that would be wonderful.